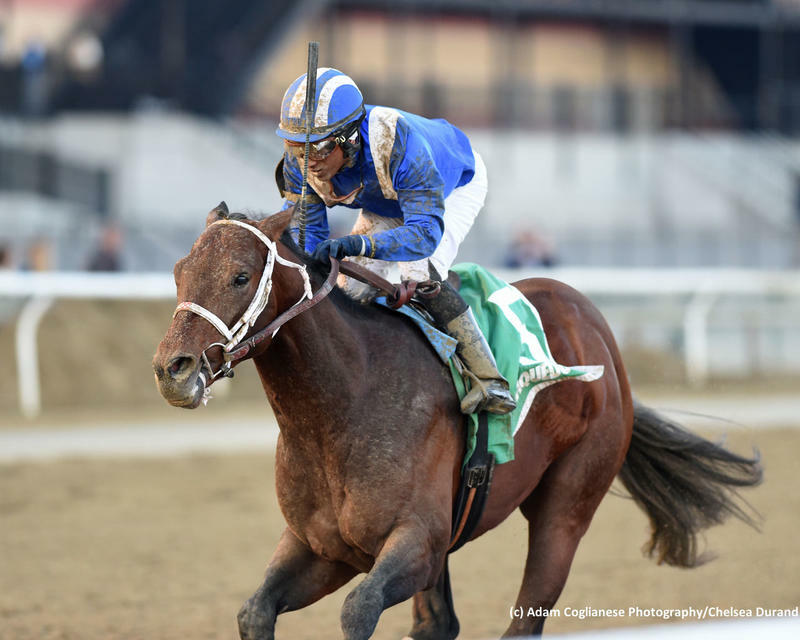 Shadwell Stable’s homebred Haikal earned 50 points on the Road to the Kentucky Derby with his late-running victory in the Gotham Stakes (G3) at Aqueduct on Saturday. The talented sophomore upped his win streak to three following his win and he now sits in a tie for third on the point’s leaderboard. Trained by Kiaran McLaughlin, Haikal kicked off his career in November and closed from last to be runner-up on debut in a seven-furlong maiden special weight race. The bay returned in December in a similar spot, and using the same off-the-pace tactics, he got up inside the final furlong to graduate. Haikal made his 2019 bow in the Jimmy Winfield Stakes and once again ran down his foes from off the early pace under Rajiv Maragh. The Gotham marked his initial try with graded runners, and he passed the test with flying colors over an accomplished field. The Kentucky-bred has improved his BRIS Speed figure with every lifetime run to date (92-95-99-102). In addition, his BRIS Late Pace numbers are strong (102-102-99-102) to indicate that he could carry his ability longer distances. He is by Daaher, who was also conditioned by McLaughlin. That son of Awesome Again had brilliance and he earned his biggest win in the 2007 Cigar Mile Handicap (G1). Daaher has not made a huge impact at stud to this point, though he has sired at least 10 stakes winners from nine crops to date. His dam is the unraced Distorted Humor mare Sablah, who is also responsible for 2017 Vosburgh Stakes (G1) star Takaful. This is a rich female line, as his third dam is English champion Shadayid. His fourth dam is Group 1 heroine Desirable, who is sibling to Irish champions Alydaress and Park Appeal. Haikal is obviously a talented colt with a brilliant turn of foot. He has class and pedigree, and he is also in fine hands under the care of McLaughlin. However, the sophomore has raced solely at Aqueduct in his four-race career and he has to show that he can take his show on the road with him. In addition, the three-year-old has yet to race around two turns, where he must prove himself in his next prep race. I have a good measure of respect for Haikal and I consider him a viable Triple Crown contender. His lack of route experience is a major concern, of course. However, if the colt shows the same turn of foot going two turns as he has been consistently doing, then he will climb up a lot of Kentucky Derby leaderboards.